Just before 1pm today a massive earthquake hit Christchurch, just five months after the first earthquake that caused so much damage. 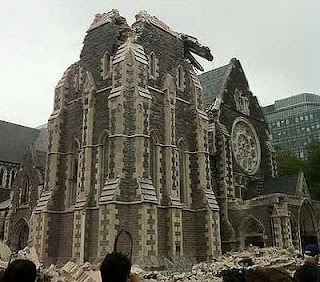 This is what is left of the Cathedral in the centre of Christchurch. The spire has fallen. There is massive destruction and tragically there has been loss of life with at least 17 dead and many more trapped in fallen buildings. It must be terrifying for all the people of the city and my heart goes out to you all. I am pleased to say that all those I know in the city are safe although traumatised. I truly hope that the city does not suffer too many aftershocks and people are saved from more trauma. Take care all of you. Add it- now confirmed 65 dead.Tragic. My love and thoughts to all. Thinking of all those affected. Marls, I appreciate you blogging about this. I have been following the ABC, Aus news, seeing video and pictures like you have posted. It's so, so sad. I have added NZers to my list of people to pray for that already include Queenslanders who have been flooded, and those hit by Yasi. Such devastation is too incredible for words. So tragic, Marls - I hope our tears, thoughts and prayers help a little! I can't even begin to imagine the feelings throughout the city of Christchurch, and throughout the country. Fear, relief, grief. Thinking of New Zealand and praying that the count doesn't rise, I can't imagine how it must be for the people of Christchurch. Stay strong New Zealand, we love you.. It was so sad and tragic that it happened. Prayers go with everyone there in New Zealand! Just found your blog again! Hope all is going well where you are and the new job is a doodle.